Bicycle! Bicycle! : At The Hipster Corral. The sad thing about North West Tasmanian bicycle infrastructure is we have yet to link up the excellent but currently town specific shared paths. The happy thing about North West Tasmanian bicycle infrastructure is that this results in cyclist clusters at either end of each path, providing me with bicycle spotting opportunities. Especially in the case of the Wynyard path which ends (or begins, depending upon your point of view) at Bruce's*, the beachside café with bike racks and a heap of community spirit. 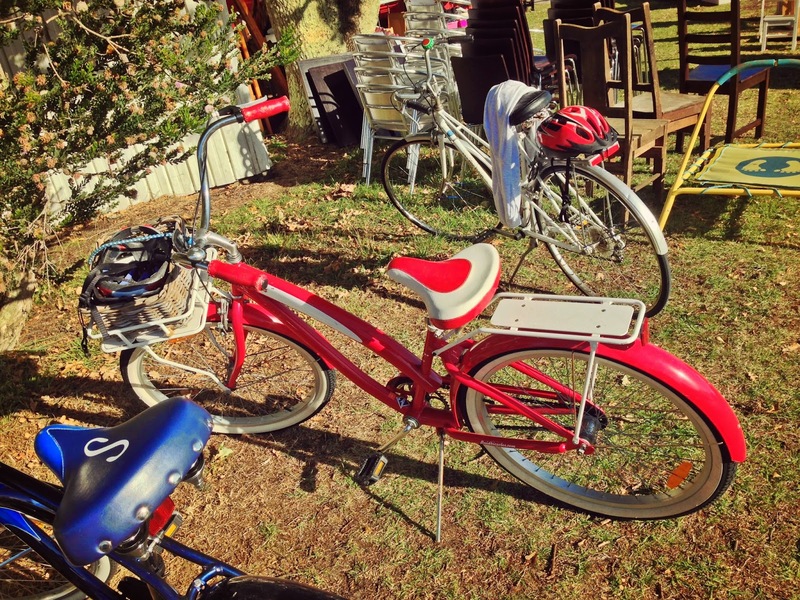 This community spirit compelled them to have an end of summer garage sale, at which Ginger and I bought a rotary phone (Peak Hipster) and mingled our two-wheels with the sunscreened masses. The bike racks were surrounded by second hand goods. The cruiser & us. The cruiser is apparently a Fluid brand bicycle - which, ew. But here is where Australians can buy them. The red Fluid (Again, ew. Yet I've no problem with the word moist. Go figure.) was certainly eye-catching, especially with more inbuilt carrying features than your average cruiser. 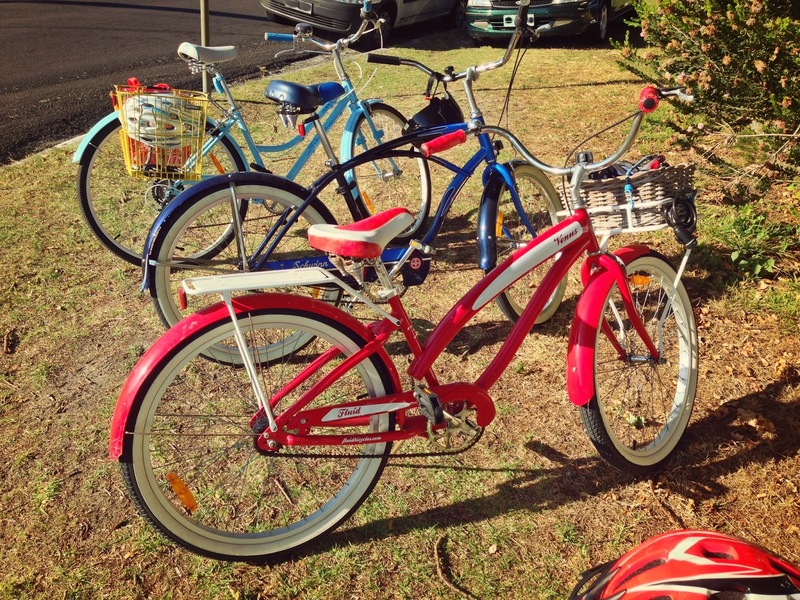 Just look at Ginger's blue Schwinn next-door for comparison. Not even a back rack let alone front carrying. The front basket was added by the owner but fit so perfectly I had no idea until I Googled the bicycle brand. The rear rack has no 'rat trap' but as you can see in the first picture there's a gap for attaching straps or tying something on semipermanently. 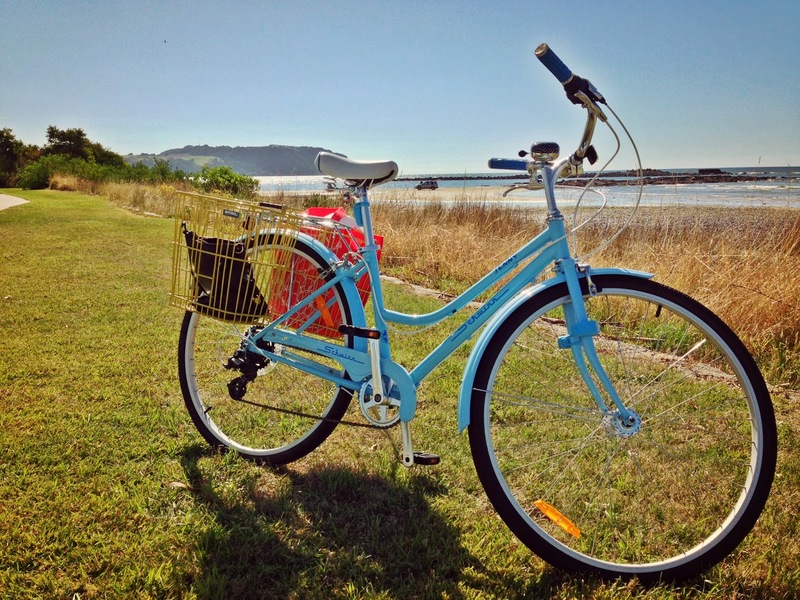 A pretty perfect bike for Wynyard which is flat, has some interesting shops, a boardwalk section of shared path and plenty of beach to pose your cruiser next to. Or which ever kind of bicycle you own. *Since I first mentioned Bruce's last year, I have befriended the proprietors. Another wonderful thing about life in Tasmania. I still pay for cake and tea like everybody else and they have no idea I am blogging about their café.